Here's a campaign from South Africa. 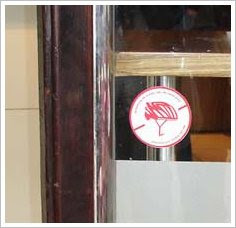 A chain of fashionable cafés - Vida e - have placed these signs on their doors. No helmets. 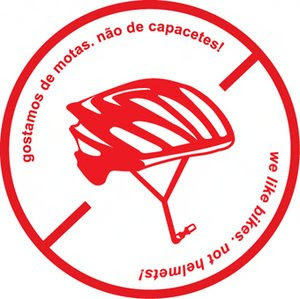 The amusing blog 2 Oceans Vibe posted about this campaign against socially unacceptable behaviour such as wearing a bicycle helmet whilst dining. Here's a shot of the door of their Kloof Street establishment in Cape Town. 2 Ocean Vibe also has an ironic, ongoing theme where readers send in photos of other shocking examples of what they deem "socially unacceptable behaviour". Generally focusing on people wearing those helmet thingys indoors. 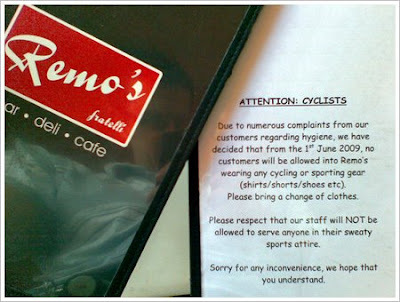 And 2 Ocean Vibe also reports about another establishment that refuses to serve 'cyclists' in 'cyclist clothes'. "Due to numerous complaints from customers..."